A electrical distribution board (or panel board) is a component of an electricity supply system which divides an electrical power feed into subsidiary circuits, while providing a protective fuse or circuit breaker for each circuit, in a common enclosure.Normally, a main switch, and in recent boards, one or more Residual-current devices or Residual Current Breakers with Over current protection will also be incorporated. electrical distribution board are sometimes known as: breaker panels fuse box, fuse board, circuit breaker panel, consumer unit, or CU, panel board The branch distribution boards are used for further distribution of supply to various sub circuits. These are also provided with fuses at the commencement of sub circuit. The neutral is also further distributed to various sides from the neutral link. 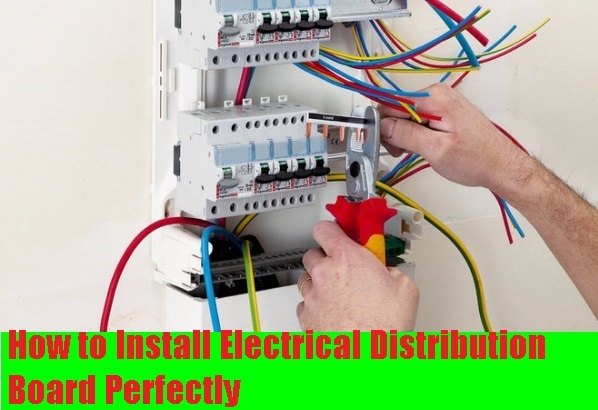 One or two spare sub circuits of the same capacity should be provided on each distribution board and branch distribution board for future requirement. The current rating of circuit, size of fuse element and detail of circuits controlled by each distribution board should also be marked. Strip the wire only enough to make the connection to the main breaker terminal lugs. The black and red wires are the feeder wires in this photo with the black wires being one of the hot feeds and the red wires being the other. • You must have to install the feeder pipe at first. • If you’re using metal pipe, place a plastic bushing over the connector threads. • Using a tape, pull the electrical feeder wires through the feeder pipe. • Leave enough wire to get to the opposite side of the panel. • Bend the two black wires to shape them for easy installation to the main breaker. • Excess bare wire leaves a safety hazard where the wires can come in contact with other wires and cause a short circuit. • Connect all of the green and bare copper wires to the ground buss bar. • If you bend the wires ahead of time, you’ll have a nice, neat wire installation that looks uniform. • Next, install the circuit feeds to the branch circuit breakers. • Connect the appropriate sized wire to the correctly rated. breaker. Bend the wires so that they keep a neat appearance when the installation is complete. 5 An iron clad enclosed pattern main switch is installed on the main board. The main board should be installed as near to the service board as possible and also near to the commencement of supply. The height of the main switchboard should be so as to facilitate in its operation for isolating the supply to the building by the consumer. The normal height of from ground level should be 1.5 meter. Seasoned teak wood or other durable wood with solid back impregnated with varnish of approved quality is used. All joints of board should be dovetailed. The main switch board which contain relevant circuit breakers should be concealed in the wall thickness in flush with the surface of the wall. The service board or energy meter board and main board close to each other and the box where the two boards are installed should be provided with shutter having glass window for meter reading and general inspection.